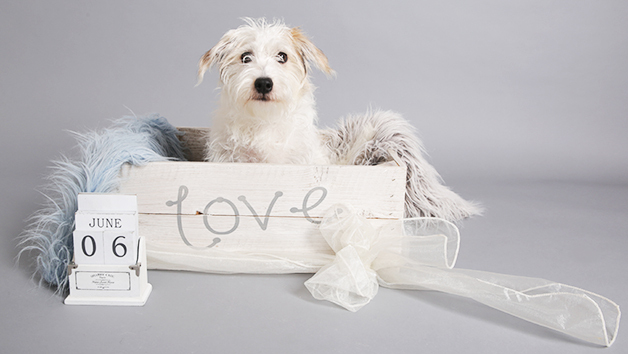 Step forward for a fun family photoshoot involving the family's beloved four legged friend! Immortalise the favourite family member in glorious technicolour with this fabulous package. During the studio session, create images to cherish with a reputable and talented photographer who can professionally capture those precious moments. Enjoy a consultation with the photographer before stepping out on set for this photoshoot opportunity of a lifetime. Create the perfect look with background changes before looking through the photos and selecting one complimentary 8' x 10' print and a keyring! Please allow 2 hours for the whole experience. This voucher is for one pet and one owner. For any additional pets a supplementary charge will apply. Please check with the studio at the time of booking. A refundable booking deposit of £25 applies. A 72 hour cancellation or rescheduling policy applies. Free parking will be available on the day. Complimentary images are of the pet only.